Concrete5 is a great content management system and it is easy to host with us. Hosting for your Concrete5 website that just works. We’ll even install Concrete5 for you! We’ll move the existing Concrete5 site! Softaculous auto-installer – Install Concrete5 in just a few clicks. GD support – Needed for many Concrete5 plugins. Zend and Ioncube support – Needed for some Concrete5 plugins. 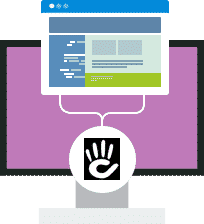 concrete5 makes running a website easy. Go to any page in your site, and an editing toolbar gives you all the controls you need to update your website. No intimidating manuals, no complicated administration interfaces – just point and click.